How can we achieve the Sustainable Development Goals (SDGs) ? We can bring them as close to the finish line as possible only by leveraging our target strategy. If we strategically align the targets and goals so that progress in one area also means positive progress in another. For example, SDG 4: Quality Education could be one of those leverage points through which many of the other Goals can be positively impacted. In this blog, we’ll look at why that is the case and in which other areas it could make a significant difference. But first, let’s briefly examine the UN’s SDG framework for Goal 4. According to the United Nations, less than half of youth worldwide meet proficiency standards. And while, more than 90% of children in developing countries have access to quality education, nearly 60 million kids are still without schooling. 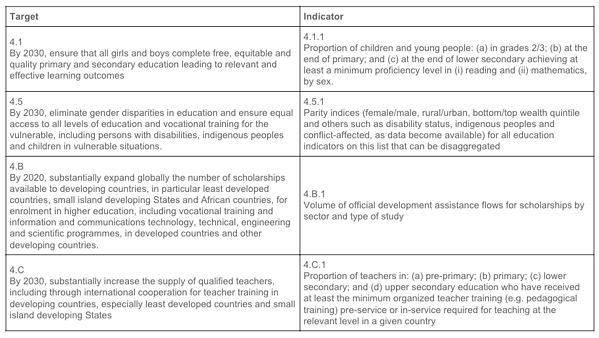 In addition to general proficiency targets in reading and math, the SDG indicators laid out by the United Nations for Goal #4 tackle issues of space (quality classrooms, rural barriers), issues of expertise (adequate teachers), and issues of gender (equality of opportunity). This demonstrates the scope and complexity of the problem. There are many variables at stake, and depending on the context, the reason for lack of access to quality education could be quite varied. The full scope of targets and indicators can be found here, while a few of the key ones are shown in the image below. When looking at how we’re doing in achieving those targets and indicators, the answer varies widely depending on the region. As mentioned, developing countries have made significant progress. But in other areas of the world, like developing countries and particularly sub-Saharan Africa, the problem remains a substantial one. While global rates of early childhood and primary education reached 70 percent in 2016 (a seven percent increase from 2010), sub-Saharan Africa stood at a mere 41 percent. The map below from the SDG Index and Dashboard Reports for 2018 the paints the overall global picture. Clearly, developed countries are far better off. Does this mean they have an obligation to help developing countries reach a similar status? The UN seems to think so. One of the targets for SDG 4 calls for more scholarship financing to flow into developing countries (it’s not explicit, but this of course implies sourcing from developed countries). Incentivizing increased capital flow for such scholarships could be about more than just Goal #4, and it should be. Because there is a clear link between a quality education and improved outcomes in other SDG areas as well. Let’s take a look at three other SDGs and explore the correlation between their desired outcomes and what access to a better education can do to help achieve them. First up, SDG 1: End Poverty. If, by 2030, we are to eradicate extreme poverty across the world then we need to disrupt the systems which perpetuate its existence. What is one of those systems? Education. A lack of access to education is one of the clearest forms of unjust systems which keep families and communities in cycles of poverty. For example, a UNESCO study found that “if all adults received two more years of schooling or completed secondary school, it would lift nearly 60 million people out of poverty.” Furthermore, another UN report shares that “one extra year of education is associated with a reduction of the Gini coefficient by 1.4 percentage points.” The Gini coefficient measures inequality rates. Second up, SDG 2: End Hunger. In addition to targeting improvements in agricultural productivity and sustainable practices, the goal tasks the global community with ending all forms of hunger and malnutrition by 2030. What’s the relation to education? There are many. The first grim reality is that many children don’t even make it to an age to begin schooling. The under 5 mortality rate in low income countries is 14 times that of the richer counterparts. One of the things that can help change that is educating mothers in such countries about nutrition and meal planning. Third, we have SDG 3: Good Health & Well-Being. Reduce preventable deaths and illnesses. Increase access to health care. Reduce and prevent substance abuse, and promote vaccine research. These are some of the focus areas of this important goal. Virginia Commonwealth University’s research on the link between education and health yielded the graphic shown here. Two key correlations are worth noting. First, the more education you have, the higher your income potential is, and therefore your ability to access and pay for health services. Second, keeping students healthy is essential for them to be able to take advantage of educational opportunities. The path to quality education is clearly a multi-way street. And to get there, we’ll need to track SDG indicators across the goals. To address the interconnected nature of the SDGs, as we have seen in this blog, organizations of all types have to be able to manage and compare unique data sets. They need to be able to extrapolate meaning from indicators which may be defined for one SDG but which also may be relevant for another as well. Sopact’s Impact Cloud SDG Tracking is one technological solution which can handle such data sets. Built with over 2,000 metrics, including SDG indicators, if you’re organization is tackling SDG 4: Quality Education you will need to also look how your activities are affecting SDG’s 1, 2, and 3. In association with the Impact Management Project Network, Sopact integrates today’s impact measurement best practices so that comparing and managing across the SDGs can be done efficiently for actors at each level of the impact spectrum. If you’re interested in getting the most out of your SDG indicators, you’re going to need a powerful tool or tools to do so.